I know. 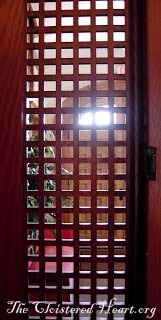 I keep using photos of the same grillwork, the same exact foyer! It is appropriate to do so, actually, because those living behind a grille look into the same foyer (or "reception room") day after day. And in the analogy of the cloistered heart, so do I. I think of the "foyer"as my mind, the place where thoughts wander in and out. I do not have total control over what thoughts gain access to the parlor. Even to walk through a mall or glance at a newspaper is to open the doorways of my senses to a multitude of ideas. However, I do have some influence over what thoughts enter in the first place. If I go to a movie in which I know there are fear-inducing or lustful scenes, I am giving disturbing thoughts free access to the foyer. If I listen to gossip, I'm opening my mind to uncharitable judgements. If I dwell at length on how I have been "wronged," or on how bad I feel today, I am setting myself up for self-pity My intention may not be to have negative, unloving, self-focused thoughts lingering around - but once these have been admitted, they often set up camp and yammer at me through the grille for days and weeks to come. These can do much to distract me from God and His will for me. They can cause my mind to wander into areas where I do not want it to go. They can, if I don't boot them out, lead me into sin.